Edinburgh is one of Scotland’s most important cultural cities. Edinburgh is home to the national parliament of Scotland (Holyrood), the National History Museum, The national Library, and Scottish High Court. The city is steeped in the political, and cultural history of Scotland. With many notable attractions to visit, which will give you a kindred feeling for Scotland. The Natural History museum, from the building itself to the fascinating contents, it never fails to delight. The Museum has hundreds of exhibits to explore. There is a beautiful T-Rex fossil in full form at the far end of the atrium which leads into the natural history section of the museum. There you will see the evolutionary path of many animals through their fossilised remains. There is also the Geology section with massive sections of crystallised rock. There is also the Anthropology section which introduces the traditions of native peoples all over the World. A science and technology section which really showcases the height of Scottish innovation during the industrial revolution. However, the real beauty of this attraction is the collected artefacts of Scotland. All the way from prehistory to the Roman conquests in Britain up to the modern era. If you would like to get an excellent panorama of Edinburgh while getting some crisp fresh air. Then a little walk up Arthur’s seat is the perfect location. What was once an extinct volcano is now the site where Edinburgh locals come to unwind with a picnic and where tourists can fully take in the beautiful old city of Edinburgh. If you enjoy a walk up Arthur’s seat there is also the splendid Princes Street Gardens. Located in the centre of Edinburgh between the Royal Mile and Princes Street. It is a large garden filled with beautiful botanics and ornate fountains. It is also flanked by the Scott monument. A tall Victorian gothic spire that is dedicated to one of Scotland’s most famous authors; Sir Walter Scott. Edinburgh Castle is also a must see attraction in Edinburgh. The massive castle is situated at the top end of the Royal Mile which is up on top a huge granite mound. Which makes the castle beautiful and impregnable. While also offering excellent views of Princes Street Gardens, and the older part of Edinburgh. The castle isn’t a crumbling ruin either. Edinburgh Castle is home to many British service people as the castle is still used as a military fortification. Edinburgh Castle also hosts the annual Royal Military tattoo. Which exhibits the incredible famous Scottish instrument, the bagpipes. Played as they should be with twenty other traditionally clad pipers and a booming marching band. The whole affair is a splendid show military discipline and musical prowess. The Castle is also home to the Scottish Crown jewels, which is an important artefact in the history of Scotland. Also, they house the famous Stone of Destiny. A large stone that was believed to have magical powers by the Scottish royal family. So much so that every Scottish monarch was crowned on it. So for history fanatics, Edinburgh castle is the trip of a lifetime. Especially if you are fascinated by British and Scottish history. Edinburgh is also said to be the most haunted city in Europe. With numerous ghost tours on offer. So for Halloween, Edinburgh is the place to be. Whether you take a walk through many of the graveyards dotted around the centre of Edinburgh. Or take a trip into the underground vaults where whole neighbourhoods were shut off from the rest of the city to stop the spread of the black plague. You’ll be sure to have an excellently creepy Halloween. Edinburgh is a small city, but it is a giant on the cultural stage. Because once a year the city opens up to thousands of amateur and professional art performances that happen all over the city for twenty-five days. It is the largest arts festival in the world. This is where artists come to test their material and hone their skills in front of millions of visitors to the city. So for culture and history, look no further than the Athens of the North. Edinburgh was the seat of the Scottish enlightenment, but the city has not been resting on its’ laurels. 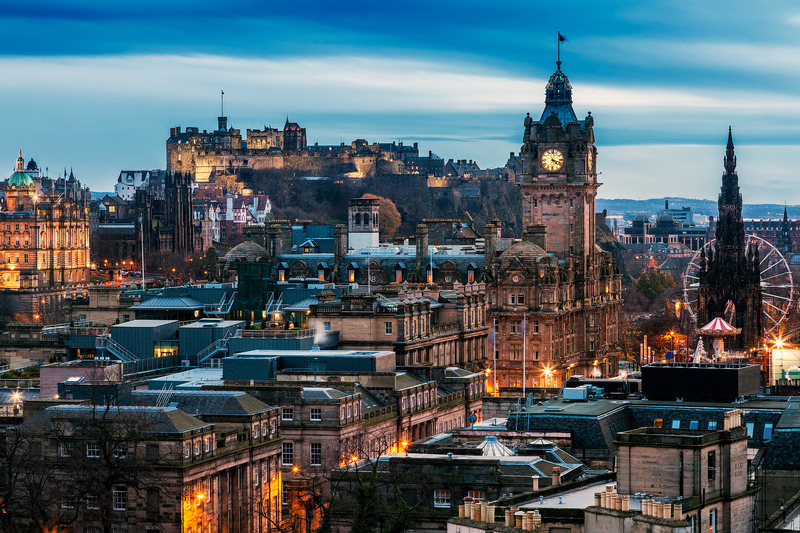 The city may be small, but Edinburgh is at the forefront of Scottish politics, history, and culture. Which means Edinburgh is an ideal destination all year round but more so in the summer with the Fringe festival. So spend next August in the Athens of the North.